I brought home a German Shepherd puppy about a week ago. he is 10 weeks old and is doing very well...as long as I remain in the room with him. The minute I leave the room he goes ballistic - screaming, crying, throwing himself at the baby gate, etc, even if I'm just in the kitchen and he can still see me. It's worse if I try to go upstairs or to a different area of the house all together. If he hasn't just been outside he will eventually work himself up to the point of urinating. He is fine in his crate after a couple minutes ONLY when I am in the room with him, like at night, and he can see me. I know that these are very much companion dogs, and thats great, and that they are very smart, and he's doing beautifully in ever other respect and seems very attentive. However, I do have to go back to work in a couple weeks so am going to have to leave him home for a while each day, probably crated or in one room until he gets a complete grip on the potty training. The vet was completely wishy-washy as to ideas of what to do or if this is a problem or not, and everyone seems to be split as to whether or not to sit and just let him whine and cry until he settles down, or if this should be alarming if it continues (He doesn't just do it for a couple minutes, he will continue on as long as I'm out of the room, so far I've documented it at 15 minutes because I was trying to wait for him to stop like I've been told before I came back). Once he is completely house trained it'll be fine for him to be all over the house and he won't be confined at all, but he can't have that freedom yet and I do still have to do things like shower, fix dinner, etc. Some people have suggested tethering, but they can't seem to tell me if that will upset them more when they eventually have to be left for periods of time after they have been with you constantly. I don't want to foster a dependence that is going to make him go nuts every time i have to leave the house. I have of course tried to give him fun treats/toys that make him work and keep him busy when I walk away, and always make a point of being very happy to see him when I come back and tell him how good he's being when hes NOT freaking out. It just doesnt seem to be making a difference. We spend lots of time together and he's only crated overnight and for half an hour or an hour during the day, so it's not that he's couped up and should be suffering from being alone. Like I said, he has only been here for a week - could he just be adjusting? as he gets more comfortable and trusting will he be better at being left? I just dont want to create a seperation anxiety - but I don't want him to be miserable now either! Any thoughts would be greatly appreciated, especially if you survived this and now have a well adjusted dog! Comments for German Shepherd puppy - Separation anxiety or just adjusting? Just read this comment. We are in the same situation w/ our new puppy, Sophie. Just got her last week. She's 9 wks old. She will only eat, urinate, and poop when I am next to her or around her for the most part. She looks for me when I leave the room and will sit by my shoes until I return. It's becoming problematic when I leave the house and my wife and kid are out home, b/c Sophie whines until i get back. She's become attached to me b/c I am home during the day and I spend the most time w/ her. We want her to be independent but it seems like she just wants someone around all the time - not possible. 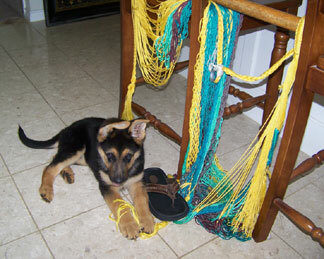 I'm no expert, but I've experienced some similar problems with my Shepherd pup. I found a few very helpful ideas that you should consider. 3. Don't make a big deal out of coming and going. He thinks you are leaving him - but that's okay, you're allowed to leave him. Wolves leave the pups behind when they go hunt, and as the leader of the pack, you're allowed to leave as well. Whatever you do, don't make a big deal out of praising him before you leave and when you return. Try tying him to the table and walking around the house, making sure to totally ignore his dramatic whines. Your pup should not be left alone to roam the house when you are not there, ever. Crate him when you are gone, always. Don't make a big deal out of it. If you have space for a dog run in the back yard, this is a great way to give him a place to be during the day where he can go to the bathroom (pine shavings). A schedule will help the pup to adjust. Get out a pen and paper and write down a schedule and stick to it. Take him for short walks. Sit at Starbucks and let him meet lots of new people. Let strangers take him for a walk. Take him to the hardware store. Let children in the neighborhood take him for walks to the end of the block. He will gradually adjust to being "everyone's" dog, and not so overly attached to you. After 12 weeks, you should start a training regime. I recommend finding a good trainer in your town and doing weekly private lessons (if you can afford). Obedience training, exercise, and exposure to lots of new things will help your pup grow to be more confident and less of a crybaby.